This little gem arrived in the post just as the past week’s snow finally began to melt and the head fell off our snowman, crushing the small family of snowdogs in the process. 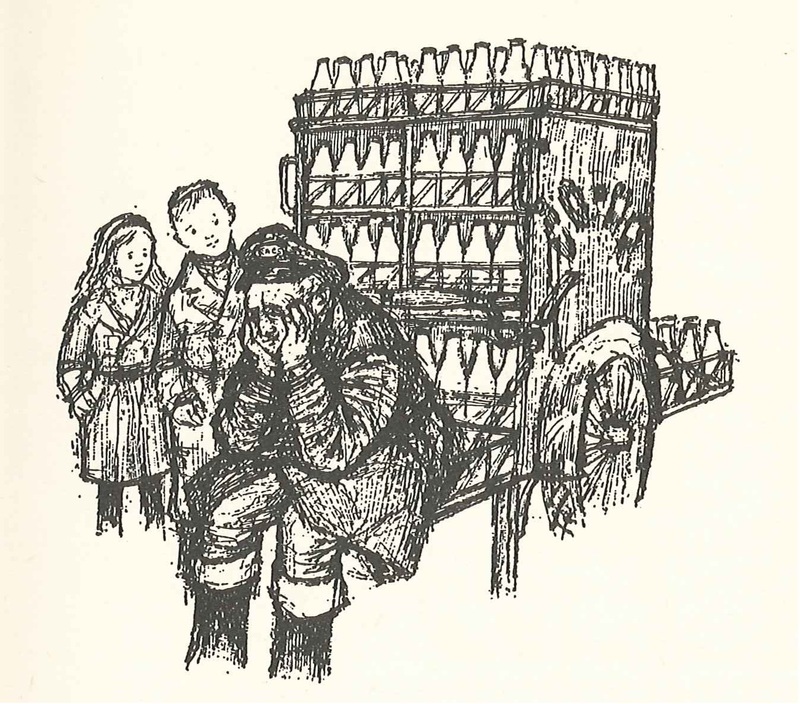 The irony was lost on my distraught children but we have fortunately been able to console ourselves reading Raymond Briggs’ very first snowbound adventure from 1963, Sledges to the Rescue. Ernie, is thankfully not the fastest milkman in the west, but an old man wracked with bronchitis. 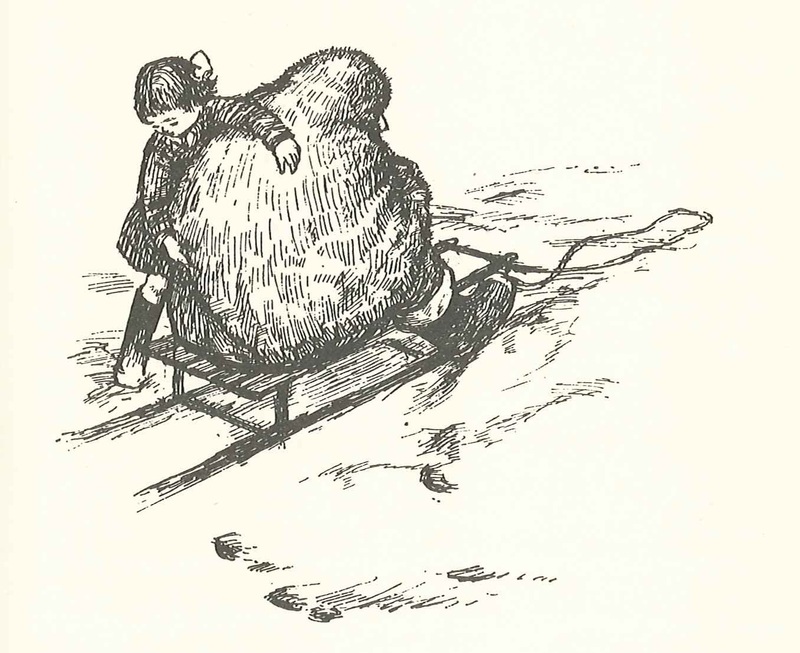 He’s unable to pull his heavy barrow through the thick snow and faces the prospect of missing Christmas altogether. But he doesn’t reckon on the local children, who gather together in a moment of supreme seasonal kindness to make his deliveries by sledge. 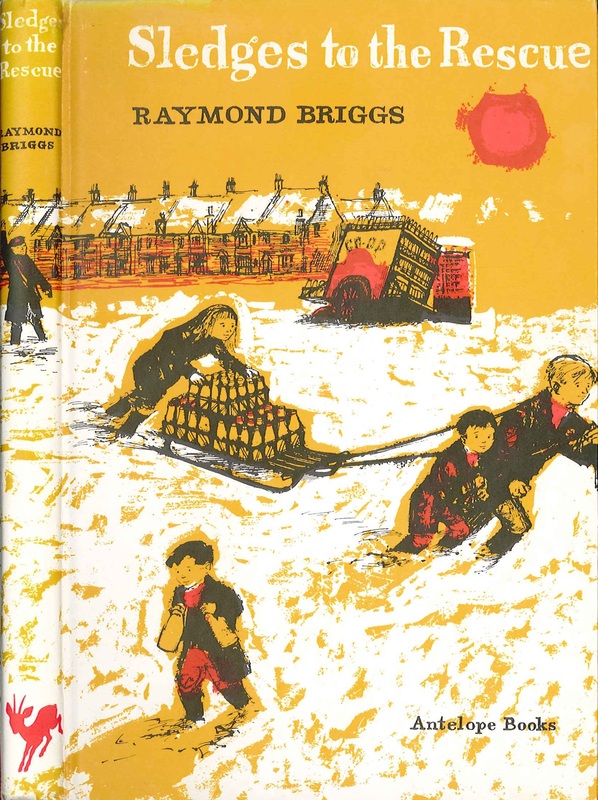 Sledges to the Rescue is one of the first books that Briggs illustrated and wrote himself. Although it’s not exactly a classic piece of writing, the drawings are sublime and as part of the Treasury it provides some interesting examples of the themes that he would return to throughout his career. 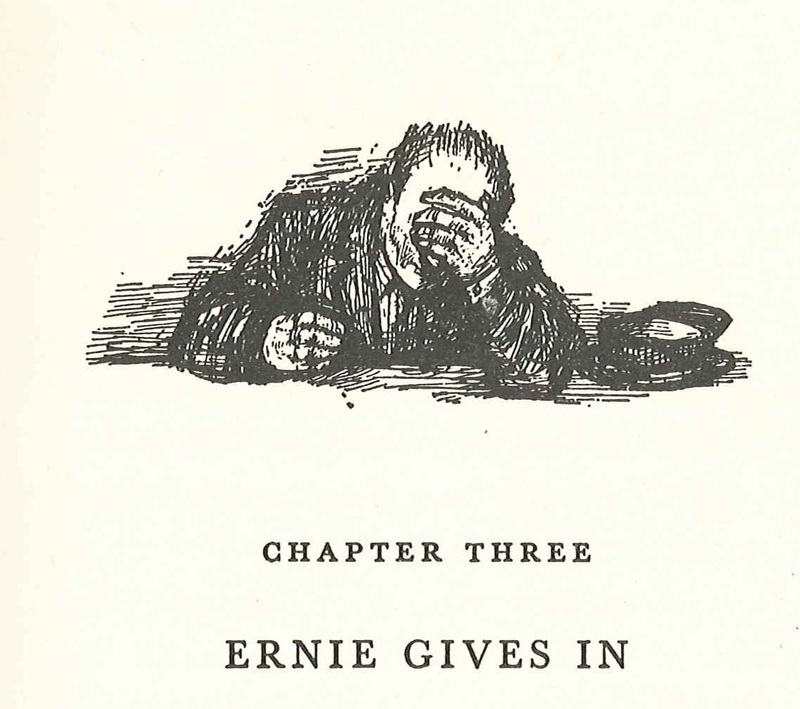 Most obviously the character of Ernie is a version of his father Ernest, also a milkman for the Co-op who Briggs used to help out on his rounds as a child. 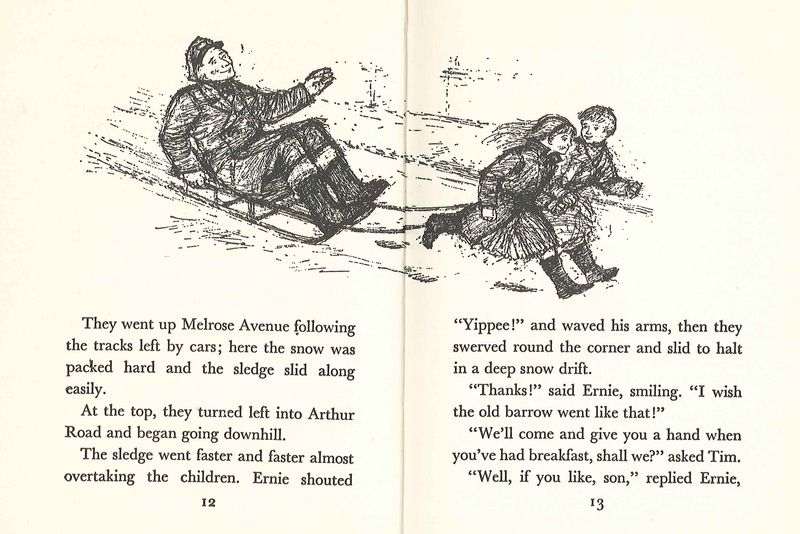 Most famously we meet Ernest crossing paths with Father Christmas as he is coming to the end of his own rounds. ‘Still at it mate?’ he asks cheerily. 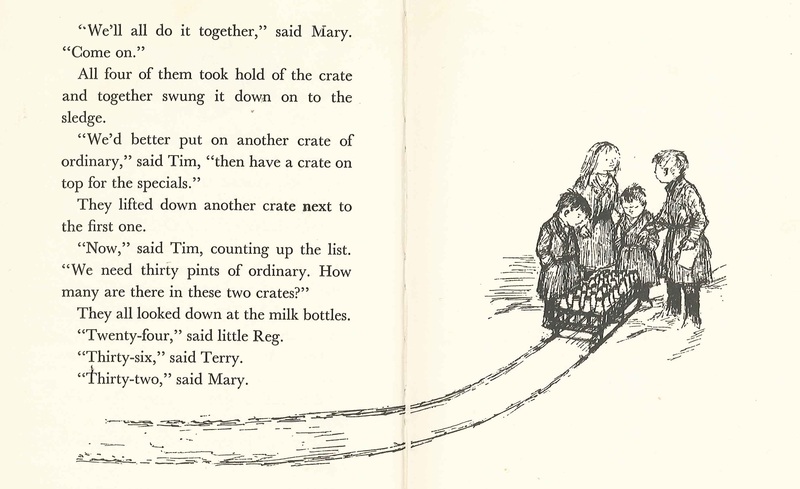 The hand pulled barrow also appears in the illustrated biography of his parents, Ethel and Ernest. Though later in his career he is shown proudly driving his new electric milk float. It’s interesting that Briggs chooses to make Ernie as old as his real father would have been in 1963, but places him in his own past, removing the electric float and giving him the arduous labour of pulling his old cart once again. There’s a good deal of social realism in the story; the children may be happy little saints, but the hardness of life for working class families is unflinchingly portrayed. The sight of Ernie collapsed at the foot of his barrow is sad, but the later picture of him bundled and helpless onto the back of one of the children’s sledges is heartbreaking. We finally meet Ethel, or Mrs Bowyer, waiting anxiously at the garden gate. Their touching reunion could have come straight out of another book about his parents, Gentlemen Jim. ‘Oh, Ernest, what a funny way to come home. You’re late too,’ she added. Re-reading Ethel and Ernest I was also struck by Raymond’s sometimes difficult relationship with his parents in the 60s. This solidly working class couple never quite get to grips with Briggs the artist, worrying about the lack of job prospects and the long hair that come with the artist’s life. It’s something that has clearly weighed on Briggs throughout his life, and his writing frequently returned to pay homage to them. Sledges to the Rescue stands apart though as it was written during their lifetime and reads as a touching thank you note to Ethel and Ernest. Tags: Ethel and Ernest, Father Christmas, Gentleman Jim, Raymond Briggs, The snowdog, The Snowman. Bookmark the permalink.